Best Graphics Group (Milwaukee, WI) were recently onsite, alongside our German Wohlenberg colleagues, at one of the Northeast’s largest Book Publishers overseeing our recently installed Wohlenberg Quickbinder Perfect Binder inline with a Wohlenberg Trim-tec 60e automated Three Knife Trimmer, book transfer conveyance, and a Busch Waste Scap Removal system. Running alongside legacy, full system Kolbus Perfect Binders, and Muller Martini Perfect Binders, Best Graphics’ compact footprint, 2,000/Hr. 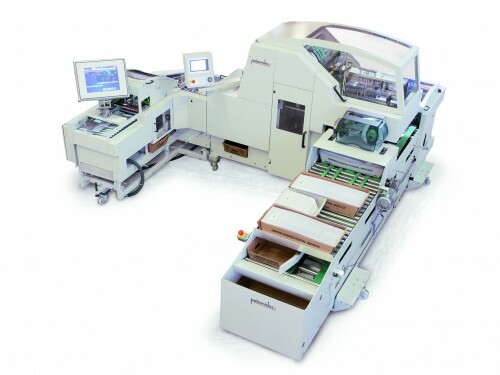 Wohlenberg Quickbinder is the reliable solution large Book Binderies depend on for second edition re-prints, “one off samples,” or 8-10,000 perfect bound book runs that would require a plant to otherwise “break in” to a full system run. Manufactured with the same principles of a our larger, full system Wohlenberg Perfect Binders with Gathering Stations, our handfed Wohlenberg Quickbinder is a robust, well constructed 15 – 20 – 25 year asset. When compared to Duplo, Horizon and Bourg Perfect Binders, designed for the digital market with a 3 – 5 – 7 year asset, Wohlenberg’s prove their meddle: (5) clamps, dual spine prep station, extra long 17″ spine length capabilities, 2.75″ max. thicknesses, heavy-duty, dual scoring shafts, rotary cover feeder, an adjustable “nip” section, EVA hotmelt and PUR spine glue options, and a gentle, laydown discharge. The machine is also extremely user friendly: our large Navigator touch screen control actuates all direct motor drives for a tool-less changeover from one book size format to another. With the growth of the digital print market, and book runs being reduced to the “just in time (JIT)” inventory model, jumping from job-to-job in moments, yet delivering a square back book perceived as being done on a full system Perfect Binder gives you a leg up on the competition. Looking to differentiate yourself? 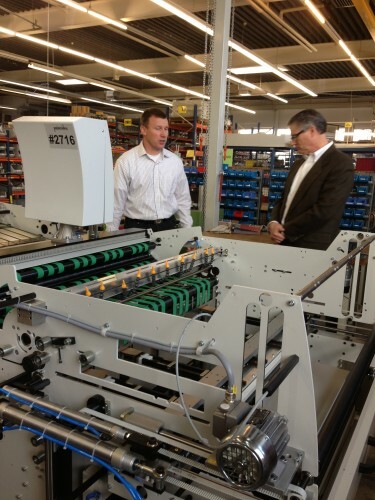 Wohlenberg’s focus on innovation, and differentiaiton is a key driver in machine sales: Wohlenberg Quickbinders, 2,000 per hour handed machines, have the ability to inline gauze. They also have “Delta 10” clamping technology to accept variable book thickness work one behind another! When it came to Three Knife Trimmers, Best Graphics’ client recognized the storied history Wohlenberg have built. 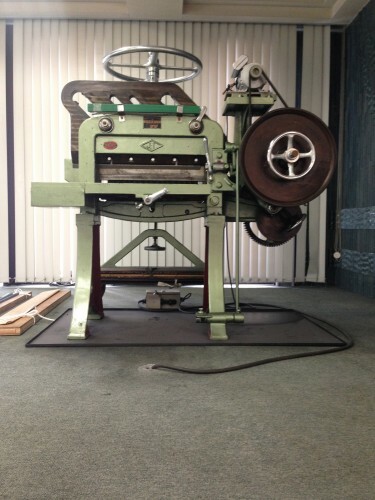 Their name is synonymous with Three Knife Trimmers, and in fact, at one point in their manufacturing career, Wohlenberg were actually producing Three Knife Trimmers for Kolbus, and Muller Martini Perfect Binding lines!! Best Graphics’ configured this system with a Wohlenberg Trim-tem 60e automated Three Knife Trimmer, our 3,600 cycle per hour machine. Like our Quickbinder Perfect Binder, the Trim-tec 60e is easily operated by a large Navigator color touch screen where all book measurement are input. Set up is tool-less, and all drives adjust automatically. Upon completion of this East Coast Printer’s “nickel tour,” the company’s management staff said they’d made the right long-term decision when comparing Best Graphics Quickbinder with Muller Martini’s Vareo Binder, and would welcome future visitors for machine demonstrations. With delivery, installation, training and a 24-month system warranty, Best Graphics and this East Coast Book Printer are well on their way to a long, formidable partnership.
. . . Best Graphics. Wohlenberg. Book smart! 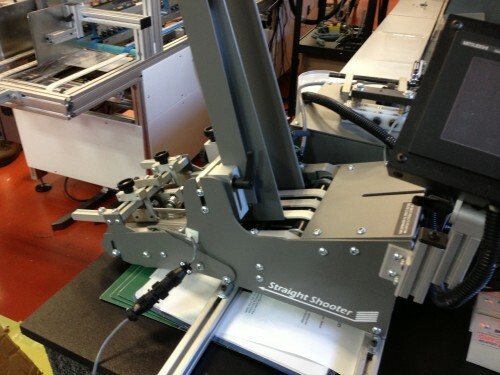 Multiple Omega Folder Gluers, at Multiple Florida Packaging Companies, Have Just Installed! Best Graphics Group (Milwaukee, WI) has recently sold, and installed (2) Omega high speed, automated Folder Gluers to Commercial Print and Packaging companies in Florida. Manufactured in Europe, one Omega Folder Gluer installed at a Commercial Printer with a growing Folded Carton business segment, while the other Omega Folder Gluer installed at a Packaging facility’s brand new plant in combination with one of Best Graphics’ South Korean built Young Shin 41″ Flatbed Die Cutters with Stripping. Best Graphics have been importing, and selling the Omega line of Folder Gluers, and Carton Packing equipment since 2015. Omega, well known as a growing competitor to Bobst Folder Gluers, has beeb manufacturing Folded Carton, and Corrugated Folder Gluing lines for almost 40 years. Their continual focus on Folder Gluer reliability, price, and customization has allowed Omega, and Best Graphics to capture marketshare in the rapidly growing North American Folded Carton market. 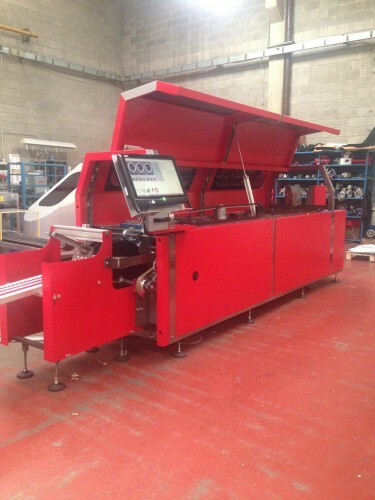 Best Graphics installed a 300 meter/minute Omega Intro 110 Folder Gluer for Straightline, Auto-bottom, and 4- & 6-corner cartons in Orlando, Florida. Our Intro series can be purchased with Carton Alignment, Motorized Carriers, and Carton Packing technology. Our Siemens touch screen controls, automation, and servo-backfold system make this Omega Folder Gluer very user-friendly for Commercial Print facilities. When compared to a Bobst VisionFold 110, Best Graphics’ Omega Intro 110 Folder Gluer allows Packaging Printers more length for complex folds, and thicker machine side frames at a more affordable price. Best Graphics installed a 400 meter/minute Omega Allpro 90 Folder Gluer for Straightline, and Auto-bottom cartons in Miami, Florida. Our Allpro series can be purchased with Carton Alignment, Motorized Carriers, Carton Ejection technology, and Carton Packing equipment. Like the Bobst “Gyro” module, only offered on the Bobst Masterfold Folder Gluer, Omega offers a “Turnpro” module for friction-less folded carton product rotation with re-register section for beverage carriers, tear strip cartons, and other unique folding and gluing applications. Omega Folder Gluers compliment Best Graphics equipment portfolio of Young Shin Flatbed Die Cutters, Young Shin Foil Stampers, Young Shin Die Cutter-Blankers, and our Laserck line of Offline Blankers with patented, automatic downstacking technology. Selling directly to Commercial Printers, Trade Finishers, Print Packaging and Luxury Folded Carton manufacturers, Best Graphic Group’s 41-year history as equipment sales, service and parts suppliers makes us a reliable name within the Canadian and U.S. Die Cutting, Finishing, Packaging, and Folded Carton markets. Have a used Bobst Domino, Bobst Media, Bobst Amazon, Bobst Fuego, or Bobst Alpina Folder Gluer? How about a used AIM Signature Folder Gluer? Is your old Jagenberg Diana Folder Gluer, or your legacy International Right Angle Folder Gluer killing your Folded Carton throughput speeds? Call Best Graphics’ sales team, or make an “Online Submission” to talk about how you can trade in your old, pre-owned Folder Gluer for an automated, high speed Omega Intro, Allpro, Alius, or Magnus today! Nothing Like Selling In Your Competitor’s “Backyard”! Best Graphics Group (Milwaukee, WI) has recently installed an automated, high speed Osako Tener Alpha Saddle Stitcher on Long Island, at New York’s fastest growing Commercial Printer. Manufactured in Japan, this Osako was installed in the Commercial Printer’s recently opened, second production facility. Best Graphics have been the exclusive import agents, installers, and post-sales parts support partner of Osako Saddle Stitchers for nearly four decades. 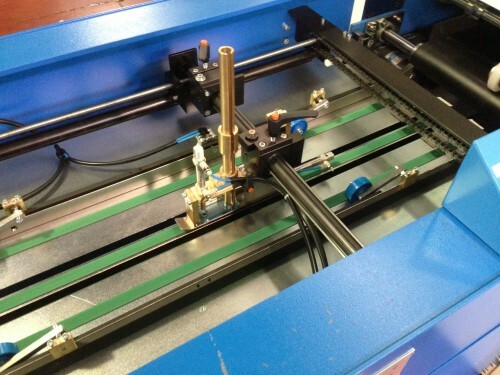 This particular Saddle Stitching system configuration included: (6) tool-less setup, double diameter signature feeders, (1) rotary cover feeder with dual-register and unmatched spine folding “crimp bar,” our 12,000/hour model 612 stitching unit with color touch screen control, dual caliper thickness detection, and bad-book ejection, an 18″+ spine length model OT-2000 three knife trimmer with 4th and 5th knife for quick, easy 2-up bookletmaking, shingle delivery section, and a waste scrap removal system. With a proven lower cost of ownership than Muller Martini Saddle Stitchers, our Osako line covers the key areas Commercial Printers, Trade Binderies, and fast turn around Digital Print Shops have come to demand in the ever competitive North American market: purchase price, automation, high speed production, and access to parts. As a North American leader in machinery sales, technical service, and a deep spare parts stock inventory, Best Graphics continues to deliver on all four categories in spades! With a 70-year history of Saddle Stitcher, and Three Knife Trimmer manufacturing, Osako is a reliable brand offered in (3) different ranges: the 9,000/hour Micro, the 10,000/hour Estar Alpha, and the 12,000/hour Tener Alpha. Robust in design, Best Graphics include an industry leading 3-year warranty on all new Osako Saddle Stitcher installations! Our Osako Saddle Stitchers compliment our portfolio offers of other leading, marquee Bindery | Finishing | Packaging equipment: our Wohlenberg Perfect Binders, our Itotec Guillotine Cutters, our Ibis variable page Smart-binder Bookletmakers, our Busch Pile Turner-Aerators, and our Palamides secondhand Delta 703 overhauling process. Have a used Heidelberg ST-90, Heidelberg ST-100, Heidelberg ST-270, Heidelberg ST-350, Heidelberg ST-400, or Heidelberg ST-450 Saddle Stitcher for sale? 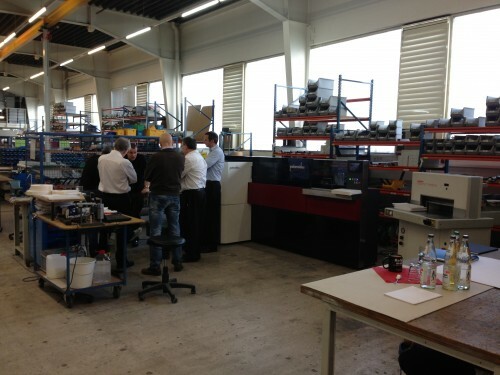 At risk of paying for costly service on a Heidelberg Stitcher that’s not worth the return? Have a secondhand, used Muller Martini Presto, Muller Martini Bravo, Muller Martini Prima, or Muller Martini Primera? Paying too much money for over-the-phone service support? 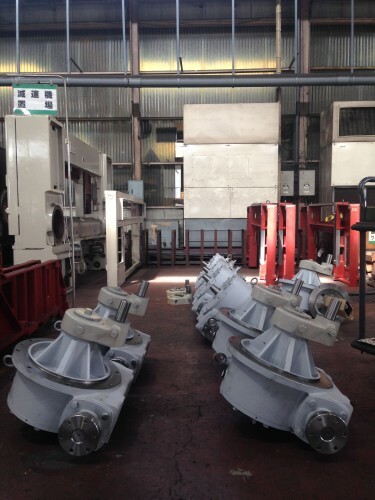 Constantly battling Muller Martini Parts Department to ensure your Saddle Stitcher parts ship out? Call us, or make an “Online Submission” today! 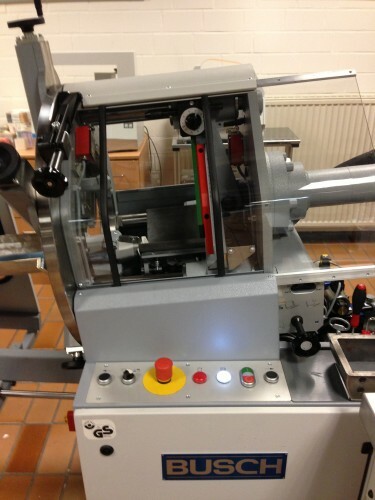 Let’s talk about trading in your high speed, used Saddle Stitcher for an Osako automated Stitcher. Best Graphics. Best Osako . . . know better value! Best Graphics Group (Milwaukee, WI) has recently installed (2) new Itotec eRC-137DX 54″ Guillotine Cutters at Los Angeles, California’s largest Trade Bindery. Manufactured in Japan, these (2) double-arm, dual clamp Itotec Cutters are this Trade shop’s fourth, and fifth new Guillotine Cutter from Best Graphics, a North American leader in machinery sales, technical service, and parts support. With a lower cost of ownership, an industry-leading five year machine warranty, and a higher productivity rate than Polar 115, and Polar 137 single-arm Cutters, Itotec is the Guillotine Cutter to turn to when making your next new, or used equipment purchase. Celebrating their 100th year in business, Itotec are the original designers of double-arm Guillotine Cutters. Producing Cutters longer than Polar, Itotec are credited as being the first Guillotine Cutter manufacturer to introduce a color, touch screen monitor for easier operator control. Best Graphics, in our 41st year as a Bindery | Finishing | Packaging machine dealer, is the North American importer and distributor of Itotec Guillotine Cutters, and ancillary Lifts, Joggers and Unloaders. Post-sales, our team of service technicians and, our deep inventory of Itotec parts gives Commercial Printers, Trade Binderies, Finishing houses, and Folded Carton shops the confidence they need in ensuring their heavy-duty Itotec Cutter will be up-and-running for 20 – 25- 30 years to come! Want to trade in your used Polar Cutter? Provide us with your used machine details via our “Online Submission” page today! Best Graphics’ travels coast-to-coast, from the United States to Canada, in pursuit of one goal: helping client’s find value (and productivity!) in their next piece of machinery. Our Sales staff would like to argue that no stone is left unturned, and no door is left unknocked! Because of this philosophy, we’ve seen it all. From family-owned “Mom & Pop” shops to 400+ employee, Commercial Print behemoths, no two facilities are the same. And we love it. We love your subtle differences: lobbies, plant shop configurations, personalities, management strategy, and your success stories. 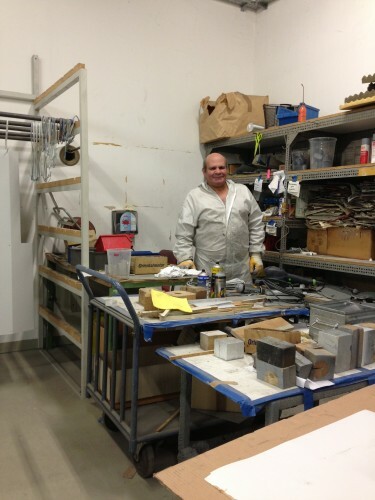 Sentinel Printing, of Long Island, NY, has a story nothing short of successful! On my latest trip to New York, I sat down to hear the story first hand. 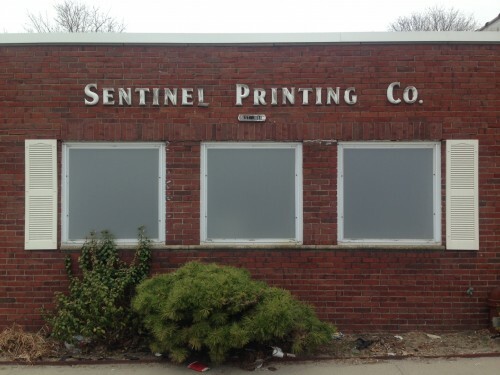 Founded in 1858, Sentinel Printing is one of Long Island’s oldest companies in operation, but more importantly, one of the oldest print shops in North America! With beginnings as a local newspaper, the company re-tooled itself in the mid-1950s as a Commercial Printer. 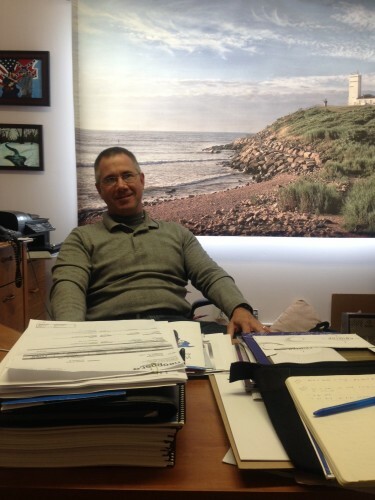 Currently run by 6th generation Owner, Glen Boehmer, the firm has re-shaped itself once again. In Fall of 2011, “Sustainable Green Printing Partnership” (SGP), a non-profit organization providing sustainability certification in the Graphic Communications industry, awarded Sentinel “SGP” certification! At the time of recepit, Sentinel was one of only fifty Commercial Print firms in the US to have completed certification. Fancy that? One of the North America’s oldest – if not the oldest – is also one of the most progressive! As the saying goes, “the only constant is change,” right? Spanning four facilities, Sentinel Printing’s production strategies adhere to strict “Green Thumb” initiatives; from ink and paper suppliers to excess waste and environmental impact. But Glen hasn’t stopped there. In the last 18 months, Sentinel Printing installed solar panels on the roof of two buildings, ultimately allowing their Digital Department – namely, two Xerox DocuColors – running exclusively on solar power energy! Looking to stratecially partner with a SGP certified shop? 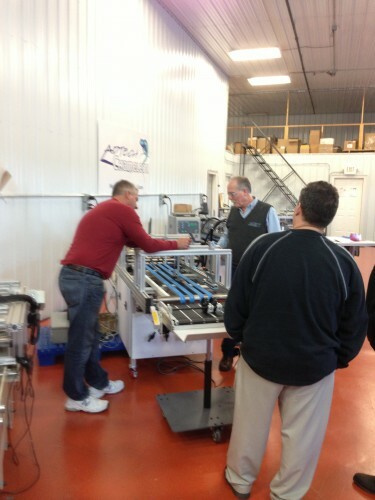 You can learn more about Sentinel Printing by visiting their website: www.sentinelinnovation.com. Have an innovative story to share with our staff? Contact me at (800) 236-7603 x 101. A Brush with Fame at Ye Olde Bucks Game! 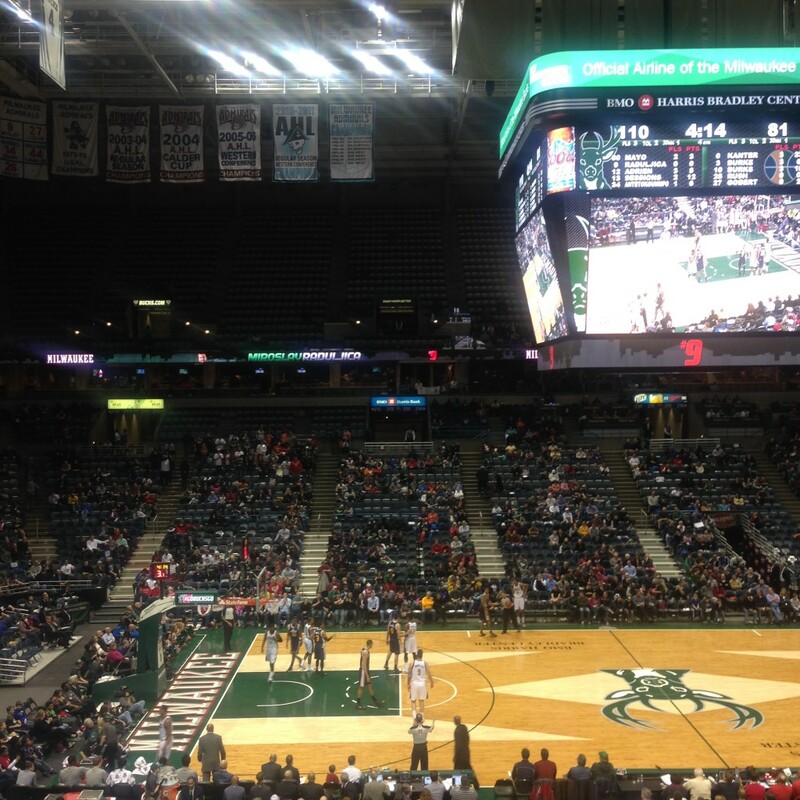 Last night, Best Graphics joined our North Shore Banker, Eric Koepp, for an evening of fun at the Milwaukee Bucks game! 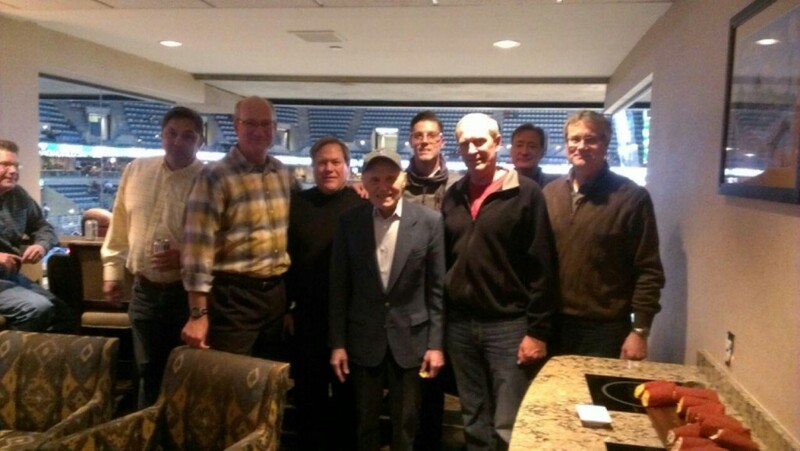 Here’s me, Dan Brahm, Eric Koepp, and other clients of North Shore Bank sharing a moment with Herb Kohl! But our run in with fame didn’t stop there . . . And no, I’m not eluding to Bango the Buck, Milwaukee’s team mascot! Midway through a 3rd quarter commercial timeout, Milwaukee Bucks legend, and 6-time NBA Championship award winning recipient, Kareem Abdul-Jabbar, graced center court to speak to the fans. To no surprise, he was greeted by a boisterous, standing ovation. 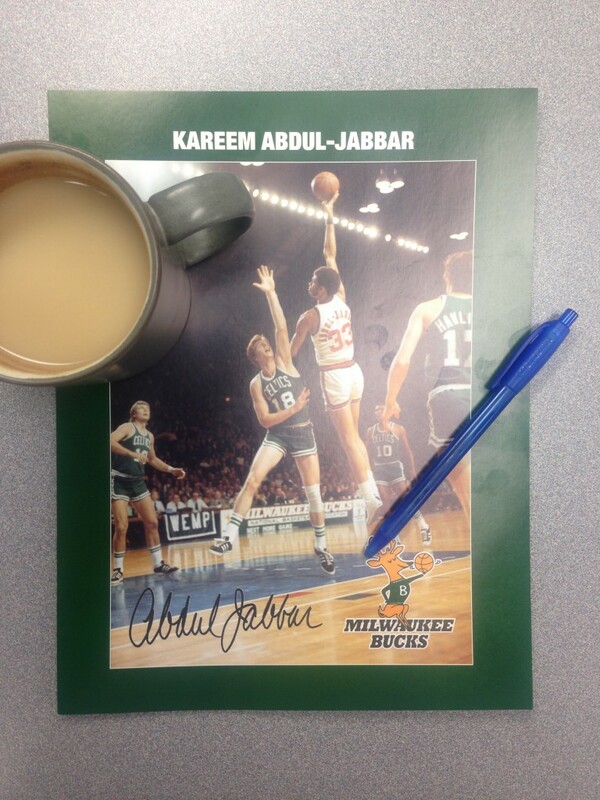 Expressing his gratitude for the city of Milwaukee, Kareem acknowledged the many great memories the Bucks organization brought him at the early stages of his NBA career, and pleaded with fans to keep the Bucks in Milwaukee. As a memento, all attendees of the game were gifted a signed Abdul-Jabbar 8.5″ x 11″ poster. Printed front and back on 80# Cover with a PMS Yellow, the “Print Nerd” in both me, and my father, Dan Brahm, was in full glow! On behalf of Best Graphics, I’d like to thank Eric for his constant partnership, and financial creativity, throughout our many years in business. We appreciate your loyalty, attentiveness to our business strategies, and above all, the 360 degree view North Shore Bank takes when it comes to Customer Service! For those of you looking for a trusted Financial lender, serving clients for over 90 years, take a moment to review North Shore Bank’s website at www.NorthShoreBank.com! Thank you for the tickets, and a very memorable night, Eric! For more information on Best Graphics’ wide array of new and used Press, Bindery, Finishing and Packaging machinery for sale, visit our website at www.BestGraphics.net. This week, Best Graphics had the pleasure of hosting clients from Long Island, Illinois, and Florida at our vendor partner’s facilities. 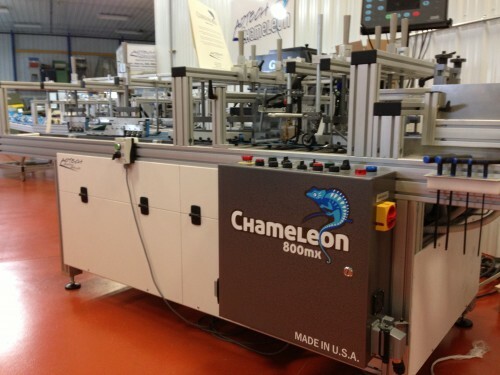 Chameleon Finishing Solutions, manufactured in the U.S.A,, has been producing creative solutions for the Packaging and Mailing worlds for nearly six years. 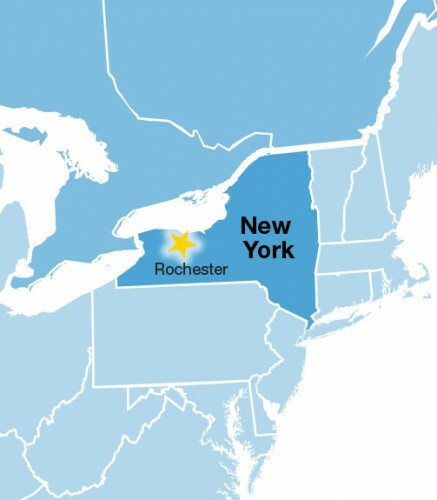 Located in Rochester, NY, Chameleon produces a line of Folder Gluers that were born in the Packging world, but have brought fresh ideas to the world of Direct Mail production. Modular in design, with a small footprint in mind, Chameleon systems are ideal for Commercial Printers who are looking to capture traditional Presentation Folders, Gusseted Pocket Folders, CD Sleeves, 3-Panel and 5-Panel Direct Mail applications, Tipping/Affixing work, Promotional Products, and Folded Carton jobs. 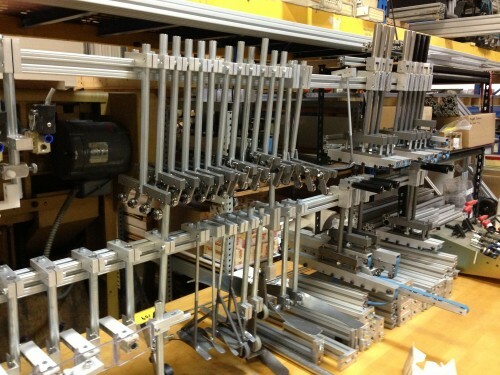 Chameleon Gluers are designed, engineered, manufactured, and assembled at their facilities in Rochester, NY. Owned by Joe Marrinan, Chameleon Finishing Solutions, shares warehouse space with their sister company, a manufacturing tool & die shop. Here’s Joe, alongside Dan Brahm, President of Best Graphics, and our clients, “kickin’ the tires” on one of the four Chameleon Gluers that were on display, and in production, this week! Have you outgrown your Kluge, or Moll, “Legacy Gluer?” Do you frequently pass on bids because your equipment can’t achieve the speeds and flexibility to run both Carton and Mailing jobs? Sick and tired of re-doing make-readies after every machine jam? Frustrated by the limitations of where your “Legacy Gluer” can cross, and plow, fold? Have you ever wondered how in the hell they do those “Iron Crosses! 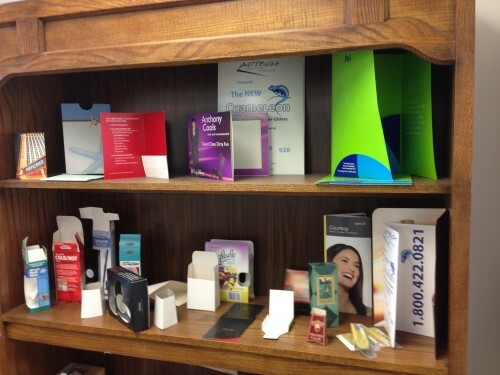 ?” Look no further, the Chameleon Line of economically prices Gluers is the innovative solution for you! Do you prefer hot melt, or cold, glue? 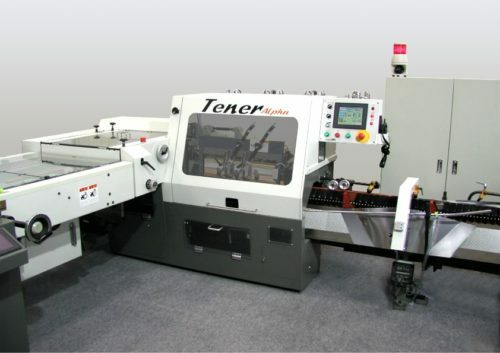 Do you need a machine in 25″, 31.5″ or 36″ in working width? Do you prefer a machine with 7 feet of transport section, or 15 feet!? Are you in need of friction fed Feeders to Tip/Affix product, or do you need Pack Smart Feeders for uniquely shaped P.I.s requiring tighter registration? 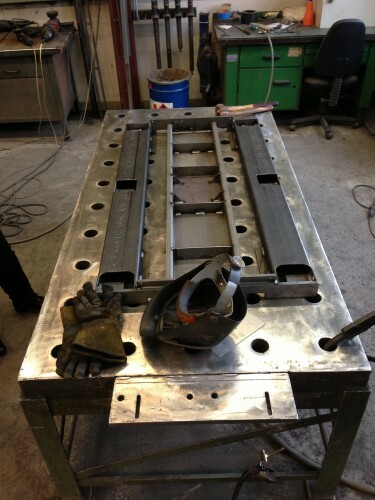 Could you use an extra Crossfold Plate, or would you prefer “Bump Turning” product 90 & 180 degrees? Would you like an inline Score/Perf module at the Pre-Feed, or do you want a heavy Compression Delivery for the extra tough substrates? Within the listing you’ll see video of the machine running. Interested in seeing more videos? We have a whole slew of them! Give us a call, we’ll be happy to send you more: (800) 236-7603. Ask for me, A.J. Brahm! Enjoy the Super Bowl weekend, guys! And if you’re from the Midwest, like us, or the Upper Northeast, like our Chameleon partners, be sure to bundle up & stay warm! Greetings from somewhere above the Atlantic Ocean – 20,000 feet up in the sky! Best Graphics is wrapping up a 10-day Europe excursion where we visit the facilities of our vendor partners – old and new! 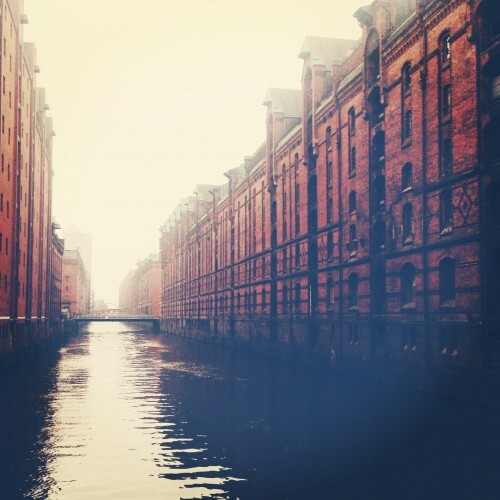 The trip spanned five cities and took us across Italy, Switzerland and Germany. Tucked in a small commercial park outside Milan, Italy lies Zechini’s nearly 30,000 square feet, multiple story headquarters. Zechini, your single source for short- and medium-run Book production, has celebrated over 60 years of success with over 1,500 machine installments worldwide. In September, Zechini forged a new partnership with our organization, thereby awarding Best Graphics exclusive distribution of their product range throughout the United States and Canada. 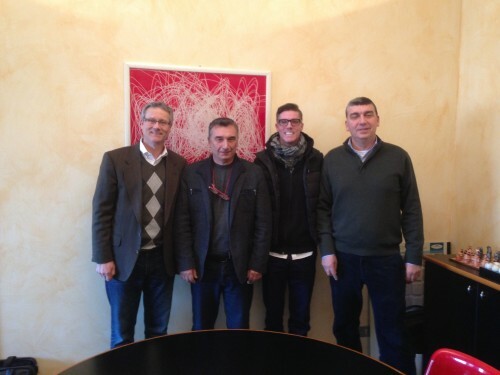 Myself, and Dan Brahm, President of Best Graphics, spent two days with our Italian partners – taking time to tour their production facility, and learn more about their front office strategy. 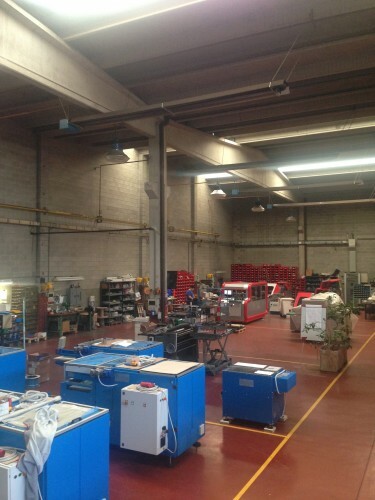 Here’s a photo of Zechini’s shop, with nearly 20,000 square feet dedicated to engineering and assembly of Casemaking, Children’s Book equipment, and most recently, Luxury Box equipment. More to follow on this front! 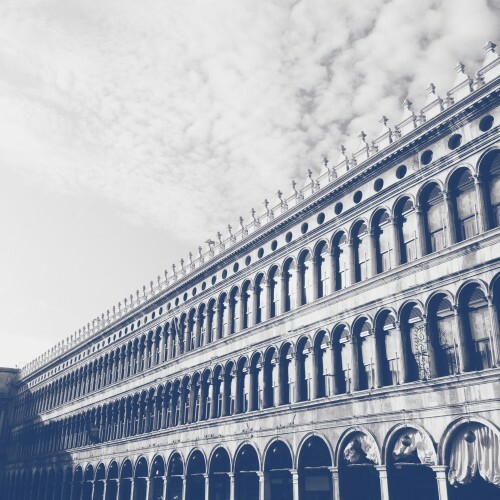 One thing can be said with certainty, Zechini is introducing exciting new products into the marketplace, and Best Graphics is eager to report. Namely, the release of both the Red Arrow, and Silver Arrow, for medium- and high-speed Children’s Book production is rolling out smoothly. The technical engineering is mechanically sound, and the marketing strategy to distribute the line is well under way. Is your organization currently producing Children’s Books? Are you subbing out the work to China, but upset with the quality produced? Look no further. Bring that work back to the States! Let a Best Graphics Sales Representative show you how! In addition to the Red, and Silver, Arrow, Zechini has released the Magneton, a high-speed inline, or offline, magnet inserter for production of Hard Cover Cases, luxury Rigid Boxes, and layflat, collapsible Gift boxes. Whether looking to source a 3-panel, 5-panel, or a 6-panel product, Zechini is your one stop shop to complete your client’s latest Casemaking request. The limits are endless, and with the high growth of the Packaging sector, you owe it to yourself to contact a Best Graphics representative today to discuss Zechini equipment opportunities. Go ahead, give us a call: (800) 236-7603, or request more information electronically here. 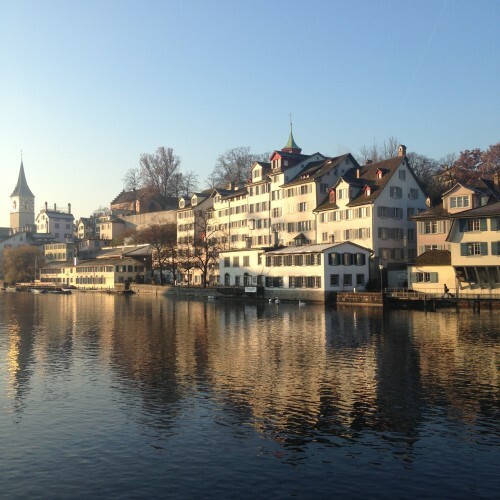 Between our time in Germany to visit our Palamides and Busch vendor partners, Best Graphics visited the quaint towns of Venice, Italy and Zurich, Switzerland. The views were spectacular! It goes without saying, but we at Best Graphics Group are truly blessed. 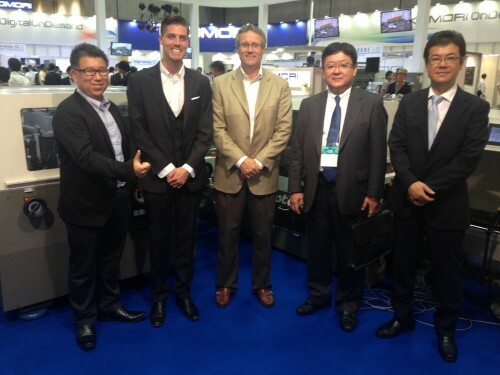 Our vendor relationships take us to all corners of the globe. 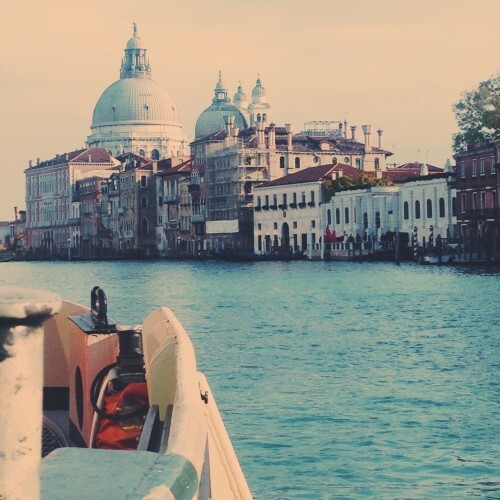 Ever traveled to Europe, or elsewhere? Share your story, or a few photos, with us. Twenty-five minutes West of Stuttgart rests Palamides 35,000 sq. foot corporate headquarters. Employing nearly 70 individuals, with technical expertise ranging from Sales to Engineering to Production, Palamides has enjoyed a nearly 15-year history. As a nationwide distributor of Palamides products, Best Graphics was eager to visit our partner’s facilities, and learn more about the two latest lines that were introduced at PRINT ’13 in Chicago. Known for their Automatic Deliveries, Palamides has released two complimentary products – the Sima 220 Automatic Letter Tray System and the SmartLiner 240 Single-clamp Hot Glue Perfect Binder. 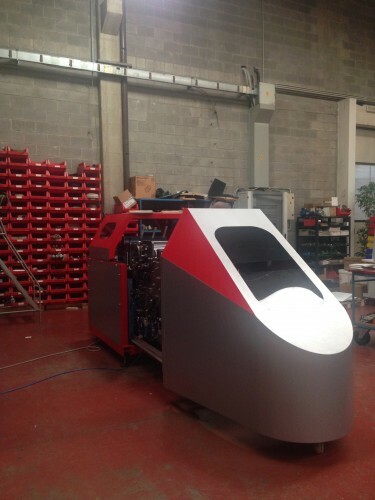 After nearly two years of R&D, the Smartliner 240 is ready for multiple shift production. 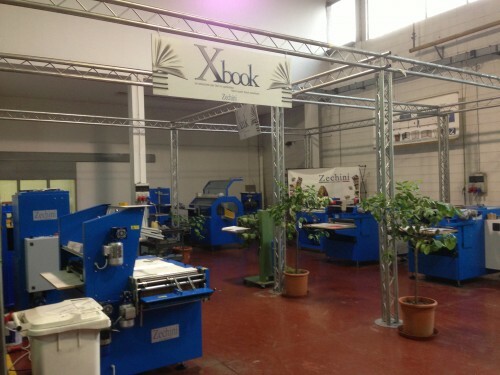 The machine incorporates patented Ribler glue technology, inevitably providing low energy consumtion “Smartflat” books. Palamides “Green Thumb” Perfect Binder eliminates the need for an exhaust system and emits no toxic fumes. 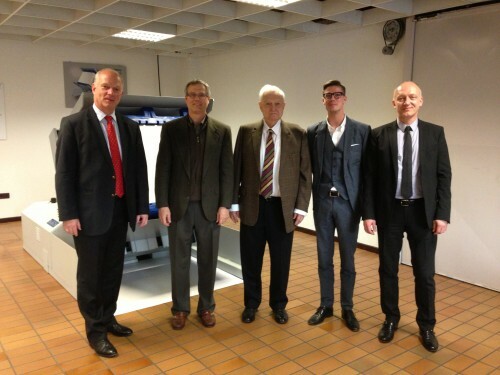 In fact, the Smartliner 240 was recently awarded the Baden-Wuerttemberg 2013 Environmental Technology Prize. 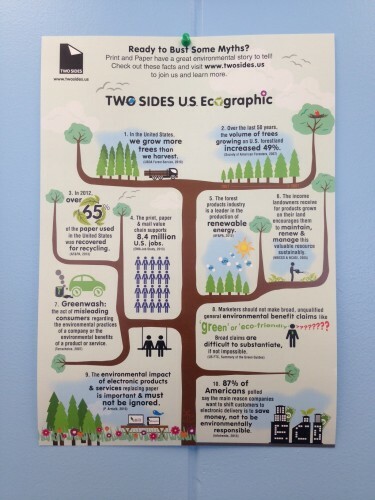 How’s that for environmentally conscientious manufacturing? 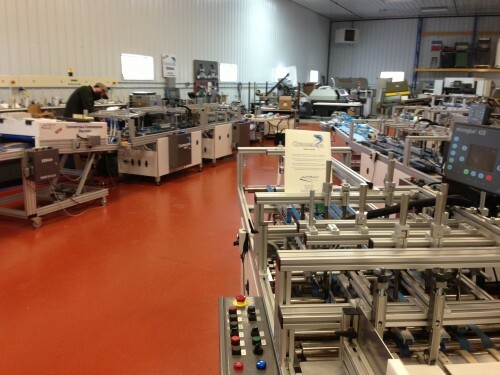 In just two months since its release, Palamides has installed four Smartliner 240s across Europe. 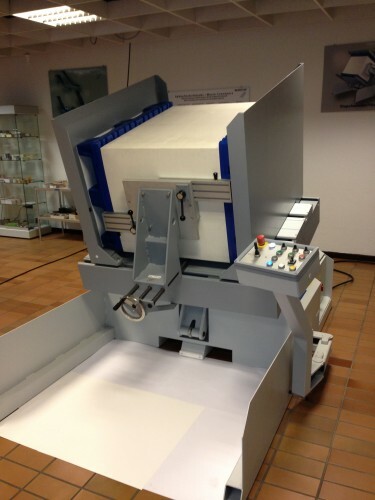 The Sima 220 Automatic Letter Tray System is Palamides second recent innovative creation. 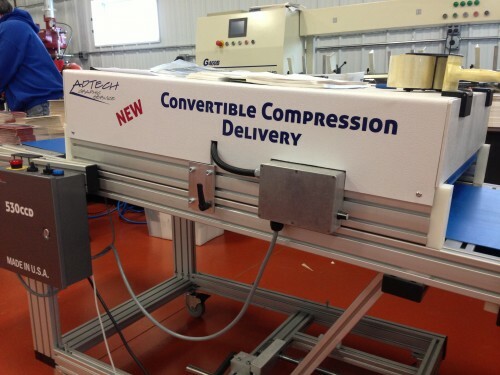 These units work in conjunction with Mail Inserting machinery in large volume, high speed environments. The Sima 220 automates the presorting and letter tray preparation processes. Checking for open flaps, non-readable addresses, and duplicates, the Sima will automatically reject bad product prior to collecting, pressing, and filling letter trays via the use of patented technology, all in accordance with USPS regulations. Have a piece of mail that’s out of sequence? Not a problem. The Sima 220’s Sequence Repair System (SRS) will reject the marked item and inform the operator what to do with the isolated item. Where are the added benefits of owning a Sima 220 you may ask? The answer is threefold: 1) Lower postal costs with automatically presorted and labeled letter trays; 2) Inline feeding of the Sima 220 from the delivery of your Inserter reduces the number of operators required on your production line, while also increasing the net throughput of your machines; and 3) PDF reporting tools can be sent directly to clients showcasing 100% delivery of their mail. In the two months since its release, Palamides has installed 30 Sima 220s across Europe and the States. Interested in learning more about the Sima 220? Don’t hesitate to ask. Call us today: (800) 236-7603. Or, email us at Sales@BestGraphics.net. Our fifth, and final destination on the trip brought us to Busch Machinery, located just 4 subway stops outside Hamburg’s metro-downtown. Family owned, and operated, by 2nd generation Busch brothers, our newest vendor employs a staff of over 70 people. 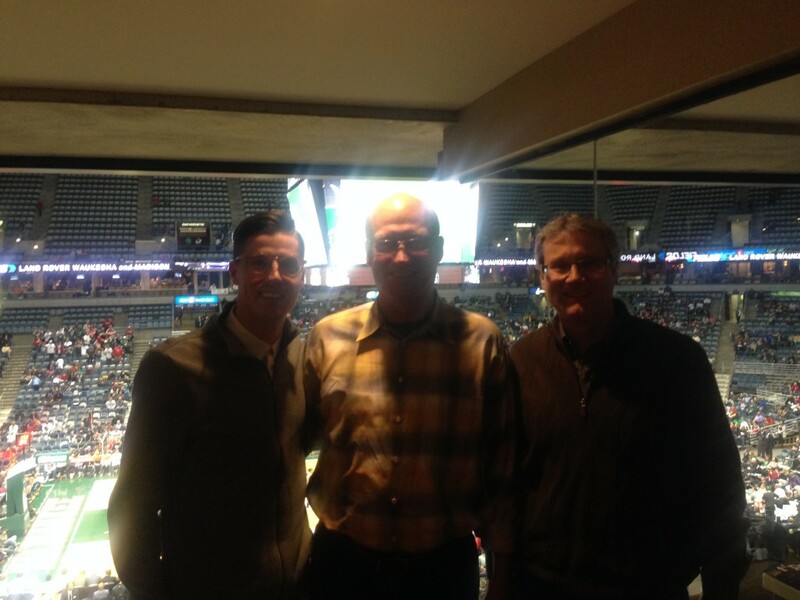 Here’s us with Burkhardt and Ekkehardt Busch, sons of Busch Machinery’s founder, their father, Gerhard Busch. Founded in 1949, Busch has been manufacturing a wide range of products to support many of the peripheral, material handling functions of a Printer’s operations – Pile Turning, Paper Jogging, Paper Cutting, Paper Unloading, Paper Waste Extraction Systems, and Paper Banding. Additionally, they manufacture Ram Punch Die Cutting equipment, more commonly referred to as “High Die” equipment here in the States. With the precision and quality craftsmanship synonymous with Germany manufacturing, Busch controls all aspects of production – right down to Metal Casting, Machine Welding and Paint Finishing. Are you looking for depreciation benefits of new capital investment before year’s end? Or, have you begun building 2014’s equipment budget? Speak with a Best Graphics Sales Representative today and let us help YOU save money on your next investment! Prefer to review on your own time? 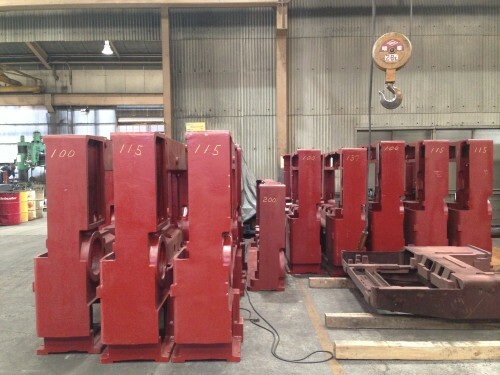 Learn more about our Busch Pile Turners here. This past week, and for the first time, Best Graphics exhibited at Graphics Canada. The show was held at the International Centre in Toronto, Ontario. The show attracted visitors from near and far – Vancouver, Calgary, Ottawa, Montreal, and everywhere in between. Unlike Graph Expo in the States, Graphics Canada is held every other year. It was also interesting to note that the show coincides with Canada’s Packaging Expo, which took place across town, throughout the week. These two differences are significant contributors to the success of the show. Namely, running the two shows simultaneously makes visitors time “away from their desks” more impactful. Likewise, operating the show every other year adds additional intrigue. Speaking of intrigue, there were many innovative products on display. 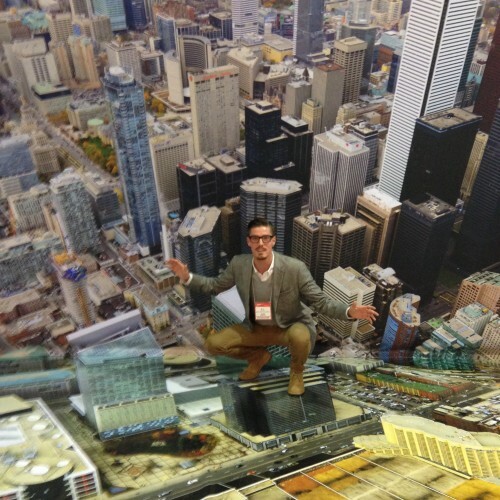 A Wide Format exhibitor decorated their entire booth with the Toronto skyline – from floor to walls! 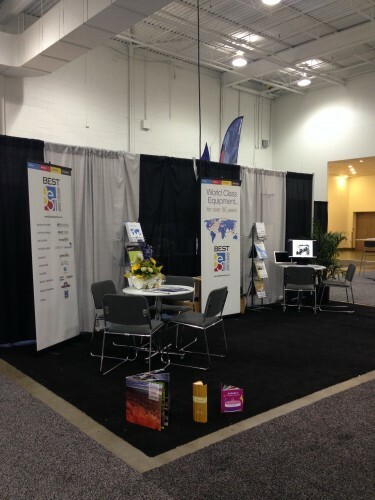 We were pleased with the turn out at Graphics Canada. It was great to see the faces of existing customer we service and support in Canada. We also generated new opportunities. And when we weren’t with clients, we took time to walk the booths and say, “hello” to vendor partners and exhibitors alike. For those who attended, thank you for making the show a success. For those who couldn’t “step away from the office,” don’t hesitate to give us a call: (800) 236-7603 x101. 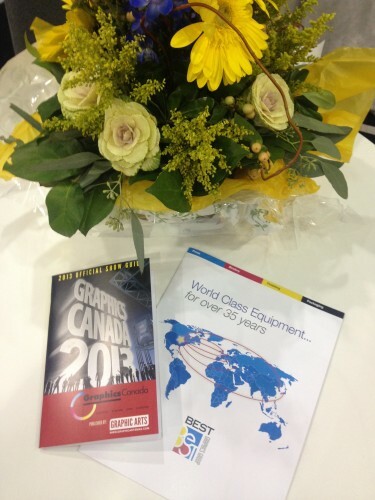 In a way, Graphics Canada 2013 was ceremonious. The event marked the debut of Best Graphics Group as an exhibitor, and the 50th year of the show’s existence.
. . . Undoubtedly, we’re already looking forward to the next! 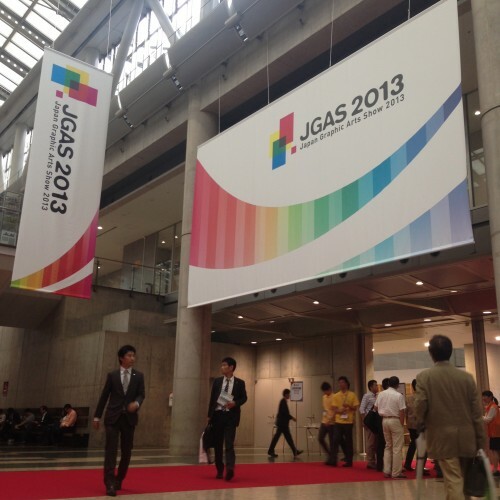 The Japan Graphics Arts Show, more well known as “JGAS,” takes place in Tokyo each October. As the exclusive North American importer of three Japanese product lines, Best Graphics makes an effort to visit our Japanese partners every few years. 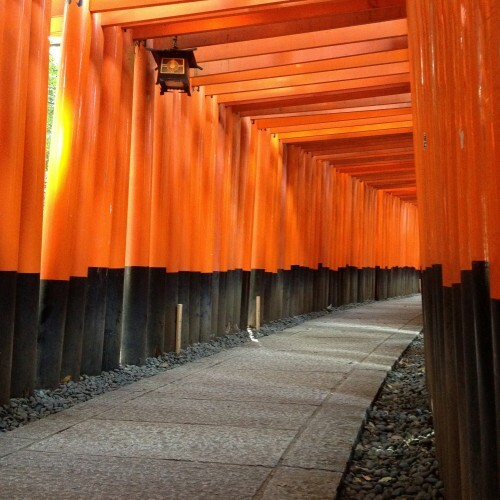 Fushimi Inari Shrine | Kyoto, JP. Spanning four cities in six days, Dan Brahm, President of Best Graphics, and I were fortunate enough to visit the production facilities of our partners, and attend JGAS. 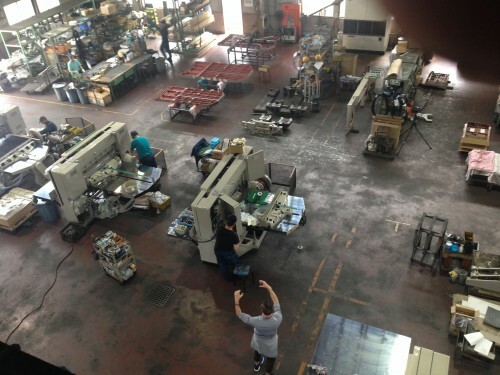 Itoh, our line of Guillotine Cutters are located on the outskirts of Nagoya. Most famously known for its Toyota production plant, Nagoya is Japan’s 3rd largest city. 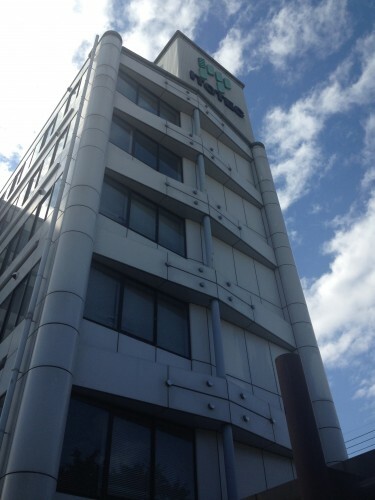 Itoh’s headquarter’s include a beautiful 5-story office, in addition to a bustling factory. Global demand for Itoh Cutters warrants production capabilities exceeding 25 Cutters a month. Its no wonder Itoh is the country’s leading Cutter in the market place. Similarly, each successive model thereafter has been photographed and framed, neatly hanging on display for all to see. As a 5th generation, family owned company, Itoh’s story is just as remarkable as their impeccably designed machines. After leaving Nagoya, Best Graphics headed northward to Saitama Prefecture, a small provence outside of Tokyo, and home to our Osako Saddle Stitchers and Kudo Joggers. 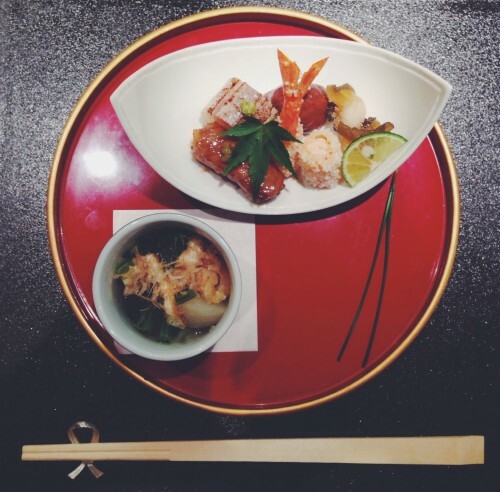 We enjoyed a lovely traditional Japanese meal at Minato, a small family owned restaurant that intimately seats a maximum of 16 to 18 customers. The following morning took us to JGAS, where we were to view our vendor partner’s booths, meet some of their prospective clients, and demonstrate newly unveiled equipment. JGAS 2013 | Tokyo, JP. Osako released their small footprint, economical 3-Knife Trimmer. For more information regarding our line of Osako Saddle Stitchers, visit our weblistings, here. 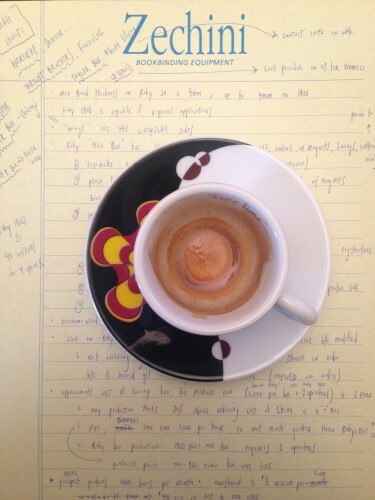 Or, take a moment to review Osako’s website, here! Pictured next to the new Trimmer are (L to R) Bazza san, Myself, Dan, Takaai san, and Teruaki san. We wish all of our partners – Itoh, Osako, and Kudo – great success, and hope the momentum of a fantastic JGAS converts into new machine placements by years end!